Now little mermaids can dream big with their favorite dolls dressed in this matching mermaid doll tail set featuring gentle pastel colors! This two-piece set for 18-inch dolls features a tail and top of swimsuit fabric. Doll not included. 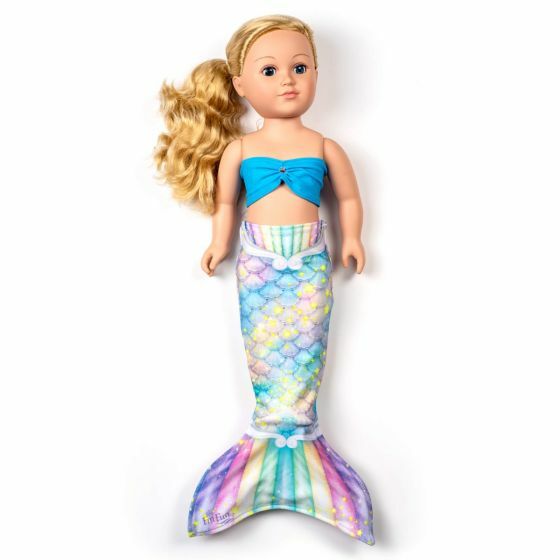 Now your daughter can match her 18-inch doll with Fin Fun’s Sweet Dreams mermaid doll tail set! Mermaid lovers will absolutely flip for this two-piece set featuring a fabric mermaid tail and top made of swimsuit mermaid tail fabric. Plus, the pastel rainbow scale design looks so sweet paired with the sky blue bikini top and accent jewel!